A very long time ago, like many other amateur astronomers, I developped the desire to own a large amateur telescope. The definition of “large” in the early ’70’s, when I started out in this hobby was not the same as today. In those days a 12.5 inch was considered large and a 16 inch, enormous. It was natural to mount our instruments on equatorial mountings, with all their advantages and invonveniences. Sometime around that period John Dobson and his San Fransisco Sidewalk Astronomer friends forever changed our perception of “large”. Suddenly, we were thinking in terms of 20 and 24 inch F/6 behemoths. A decade or so after this, Al Nagler started introducing revolutionary eyepiece designs that would allow shorter and shorter focal ratios. It is during this exiting period that my dream telescope took shape in my mind. The final result can be seen in the above pictures. Although I followed the Dobsonian revolution as it unraveled, I had gotten used to equatorially mounted telescopes and wanted my instrument to track. 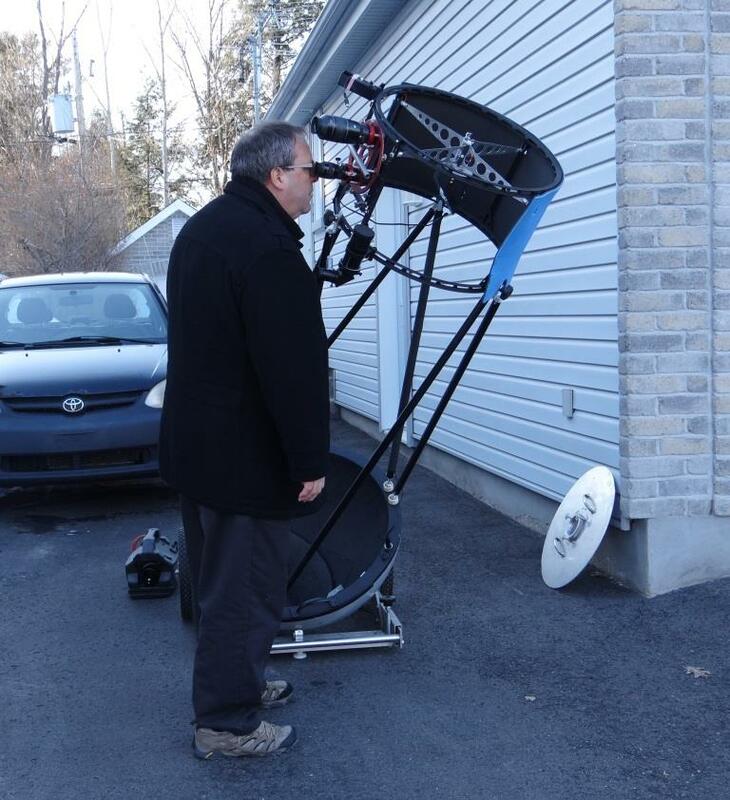 I had also enjoyed using the 16 inch Ottawa (Canada) center club telescope with it’s rotating Upper Tube Assembly (UTA) with dual eyepiece turret and also longed for this feature. The end result was a large, tracking ball scope. Little did I suspect I would spend more than 20 years building it. That to attain my goals I would have to litteraly invent a new tracking platform, as well as a few other innovations that had rarely, and in some cases never been seen before. Of course I did not actually work on the project for 20 years! I had a lovely young family to look after, a demanding carreer, and very little time. I would sometimes work for a few months on my project and then do nothing, sometimes for several years. But the dream lived on and I persevered. In this part of my website I describe the design and fabrication techniques used to manufacture this unique telescope. I demonstrate how I made the large 30 inch diameter hemisphere that constitutes the heart of the mount, the f/3.9 conical mirror and the fabrication techniques I used to grind, polish and parabolize it, the Optical Tube Assembly (OTA) including the unusual primary collimation system, the rotating turret eyepiece holder, and, of course, the large, dual-axis, multi-lattitude equatorial tracking platform specially designed for ball scopes. My 20 inch telescope making project evolved from a desire to own a large instrument that would also be portable and easy to assemble, disassemble and use. I had built and owned telescopes from a 60mm toy store department refractor and small Newtonians from 6 inches to a 12.5 inch f/5.2 Newtonian on driven equatorial mounts. After studying hundreds of telescope designs in the 16-24 inch sizes I came to the conclusion that the ball scope was the best candidate, with a horseshoe mounted telescope as a plan B and a Dobson on a Poncet as Plan C. In the end my original plan of building a large ball scope was a success. Among other recognitions, the 20 inch ball scope received the first prize for Mechanical Design and the Second Prize for Workmanship at the 2013 Stellafane Telescope Making Competition in Vermont. I continue to improve it (there is always room for improvement) but it is an instrument I am very pleased with and which, I am convinced, will provide decades of observing pleasure.